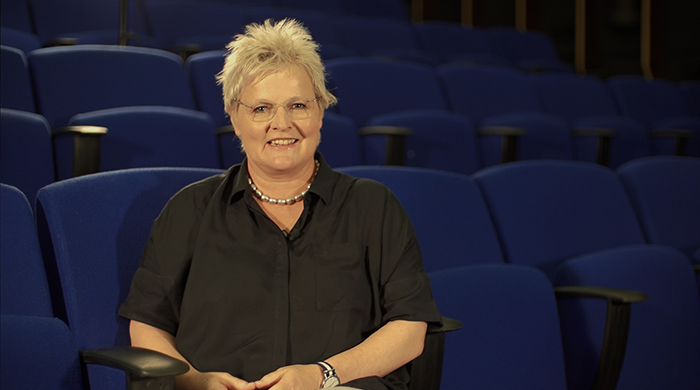 The name Karen Meiring is synonymous with entertainment, from her early work on the stage and her contributions to South African arts festivals to her innovative work in establishing kykNet as a popular, successful Afrikaans television channel. Meiring completed an honours degree in Drama at the Potchefstroom University for Christian Higher education and started her career in the entertainment industry in 1985 at the former Performing Arts Council of the Free State (PACOFS), where she was involved on and off stage in various productions. She started freelancing in 1990 and appeared in productions for the Performing Arts Council of Transvaal (PACT) before founding the iconic and much celebrated A capella group Cutt Glass. Her work with Cutt Glass took her to the international stage with performances in various countries such as the Netherlands, Belgium and China, among others. Her love for the industry led to her establishing herself as an impresario, producing and managing many local artists such as Johannes Kerkorrel. Always a hard worker, Meiring’s involvement in the Klein Karoo Nasionale Kunstefees (KKNK) in 1994 took her from festival organiser to its managing director. During this time she received various awards and was at the forefront of new initiatives to develop the arts in South Africa, such as the Kanna Awards and the first Afrikaans musicals, Antjie Somers, Vere and Altyd Jonker. It was the year 2009 that ushered in a new era in Meiring’s life. She was appointed as head of the Afrikaans M-Net channels that now include KykNet, KykNet & kie, KykNet Nou!, KykNet and KykNetnou! internasionaal. Her expertise earned her a promotion to director of the Afrikaans channels in 2013. She continuously endeavours to support and develop the arts in Afrikaans, and many big projects to promote Afrikaans have been established under her guidance. These include the most sought-after awards in Afrikaans theatre, the Fiëstas, Die Silwerskermfees competition to develop documentaries, films and short films, the Die Ghoemas awards for Afrikaans music and the Afrivisie song-writing competition.